I made this card for the current Lawnscaping Challenge #35 - to use patterned paper. I just love this new Lawn Fawn stamp set called Critters Down Under. Ever since I visited Australia, I just love the animals there and these are just too cute! I had to use all the animals in the set - even the cute Kookaburra in the tree! I paper pieced everything only using Lawn Fawn Bright Side papers. Thanks for taking a look! SQUEEE!!! I adore these images...so cute. Great take on the challenge my friend...sweet scene! oh wow! such super fun fun card. Love the paper piecing you made and these are such cute stamps. Ha! So cute! Watch out for that alligator, Mr. Platypus! Pattern paper baby animals!!! So super cute!!! This is ADORABLE!! Love how you chose to color the critters in bright colors...so creative and fun! I really ADORE this set! Love how LF have created a critters from Oz... my list just got bigger! Your card is perfect with those fab papers and pp critters! Oh wow! What a great job you did with the new critters set! All the patterned paper and paper piecing is FANTASTIC! I love this!!!!!!! 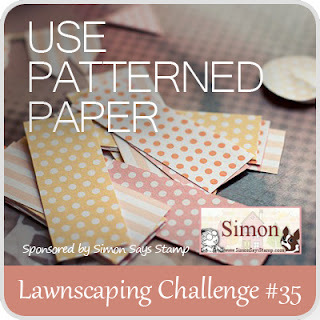 I am so glad you joined us at Lawnscaping! This card is so stinkin' much fun! I love that you were able to incorporate pretty much this entire stamp set, AND you used Lawn Fawn papers! So awesome. Thank you so much for playing with us at Lawnscaping!